Crisp snowflakes and Art Deco glamour adorn this elegant wintery style. Colors are frosty aqua and white with rich golden accents. 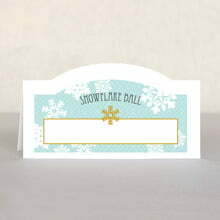 A subtle geometric pattern watermarks the background behind scattered snowflakes. 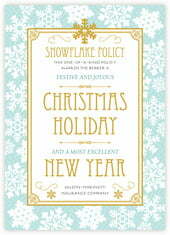 Topped off with charming fonts, Snowflake Policy brings plenty of pizazz to the season. Print this style on our pearlescent paper to add an iridescent sparkle to the snowy feel. 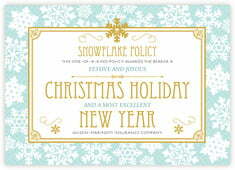 Customize your Snowflake Policy cards today!